The Door was my choice for #WIT (Women in Translation) Month (a) because it was recently reissued by The New York Review of Books (see the interview with editor Edwin Frank at The Paris Review) and (b) because I read the article at The New Yorker. First published in Hungary in 1987, but not in English till 1994, the French translation won France’s Prix Femina Étranger in 2003, it was nominated for the 2006 Independent Foreign Fiction Prize and in 2015 it was first on the NYT’s 10 Best Books List. And Magda Szabó has the distinction of being the only female Hungarian author included in Michael Orthofer’s The Complete Review Guide to Contemporary World Fiction (my new bible for international fiction). The Door is a very intense reading experience. The book begins with a melodramatic prologue in which the narrator says that she has ‘killed Emerence’ but the confessional tone isn’t borne out by the testimony that follows. 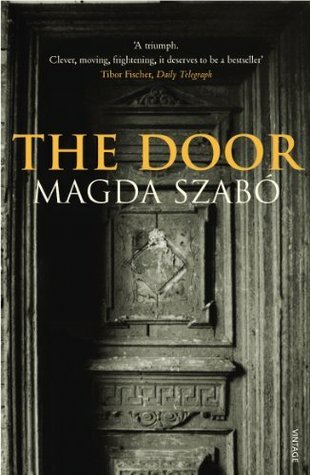 The narrator, who isn’t named as Magdushka until near the end of the book, is a self-absorbed middle-class writer who (like many authors in communist-era Hungary) has had her work censored but with the relaxation of restrictions is now becoming so successful that she needs some domestic help. But from the moment Emerence comes into her life, she begins to develop an obsession with this quixotic old woman, and she vacillates between exasperation and craven submission to her whims. So the narrator takes the reader on a roller-coaster ride of emotions and irrational (and sometimes violent) actions, one feat of oneupmanship after the other. The Door is not easy to follow when one’s mind is not fully engaged. The characterisation of the two interdependent women reminded me of those grotesque European fairy tales, where the women are either horrible old peasant crones or princesses. There is a vast social gulf between these two, but communism has inverted relationships. Magdushka thinks she’s interviewing Emerence, but Emerence is actually assessing her potential employer. And when she accedes to Magdushka’s request, it’s on Emerence’s terms. It’s always on her terms. She will come when she likes; she’ll clean where she will; she insists on bringing horrible bits of broken bric-a-brac to decorate the home; and she makes them take in a dog inexplicably called Viola (it’s a male) which neither of them want. If challenged, she sulks or throws tantrums, and in a panic over losing her, Magdushka always gives in. Along the way she rationalises her own behaviour with a mixture of amateur psychology and self-doubt. Is uneducated Emerence really as clever as the narrator thinks, or is she just rationalising her own meekness in caving in every time for fear of having to do her own laundry when she is so busy? Over twenty years the relationship vacillates between peace and drama, both of them manipulating each other. At the same time, Magdushka betrays Emerence time and again, right down to upstaging her at the hour of her death. For all that Hungary had been under Communist rule since the war, class distinctions are never far from the surface, and *SPOILER ALERT* most readers will probably enjoy the delightful moment when Magdushka beholds her valuable inheritance which is in such impeccable good taste – only to see it crumble before her eyes. I found an interesting review by Juliana Brina at The Blank Garden who makes much better sense of it than I did. Claire at Word by Word reviewed it too though likewise I didn’t read her review until after I’d finished writing this. And hey, Claire, I agree, The Door is indeed an overwrought, neurotic narrative! Don’t do what I did… you can buy paperback copy from Fishpond for $13.57 (The Door) and that’s what I should have done. *chuckle* I blame the tyranny of distance. Sometimes when I want a book quickly and it isn’t available at any of my usual haunts, I succumb to the Kindle to be sure of having the book. (Recently I ordered one to join in something else and missed it by a week because the book took too long to get to Australia). I may be the only person who did not like this book. I found the narrator irritating and overwrought and totally convinced that her political and social and aesthetic views were the only ones to be taken seriously. Perhaps it was the author’s intention to make me dislike the narrator; if so, she succeeded. Emerence was a person who had had certain experiences and who was faithful to her view of things. Why should she not have been independent in offering her services? What made the lady-writer-narrator so worthy of being served in just the way she wanted? And yes, she did betray Emerence. Yes, that incident with the chipped ornament was interesting for the way it showed that she had to revise her ideas about how her apartment was going to be decorated according to her taste and no one else’s. I mean, what a palaver about an ornament! I could just picture that husband raising his eyes to heaven over this incredible battle of wills. The class thing was interesting. It suggests that after half a century of communism there were still clearly discernable class distinctions. Unless the (unreliable) narrator was deluded, everywhere she went she was treated with deference. That might have been partly an esteem for intellectuals – Svetlana Alexievich wrote about the Russian reverence for their writers. The translation uses the term ‘lady-writer’ but I don’t know whether we can take the use of the word ‘lady’ to mean more than female. #RamblingOffOnATangent: in my lifetime we’ve stopped using the English word ‘authoress’ – an author is an author is an author, regardless of gender. And again in my lifetime we’ve stopped calling some women ‘women’, and others ‘ladies’; now the terms are interchangeable and don’t signify class distinctions. (Witness the term ‘cleaning lady’). #ComingBackOnTrack: so when Rix was doing his translation, did he find something in Szabo’s text that made him translate using ‘lady-writer’? Thanks for the mention and for a great review, despite your misgivings! I love that so many of us have been reading this in August, I’ve got so much more out of it from seeing other people’s thoughts on the book. I timed it to read it back to back with the Pereine Press novella by Gøhril Gabrielsen, The Looking Glass Sisters, which was about a fraught relationship between sisters where the balance of power is not equal and there are indeed similarities, not least of which is the unreliable narrator! I read the print version, in fact more and more I am preferring to read in print, there is something lacking in the e-book experience and its annoying not being able to flick back easily. I did enjoy The Door for its psychological insight, the half-hearted guilt of the lady writer and the irony of Emerence’s superiority – there was the element of mystery too, depending on how fooled by the narrator we allowed ourselves to be. I wouldn’t read it again, but I’m going to read Iza’s Ballad for sure. In Michael Orthofer’s book, he says that she was a very popular author in Hungary, so perhaps there are a whole heap of other works that we don’t know of, Hungarian translators being a bit thin on the ground? I wonder if Pereine Press will…. PS Norwegians are so good at claustrophobic novels! Did you see that film Rams with its brotherly relationship gone wrong? Great review, Lisa! Thank you for the mention :) This book grabbed me, and somehow the mother-daughter relationship between the two women touched me deeply. I did wonder… #DrawingALongBow: when Emerence calls her Magdushka, is that a diminutive signifying child? This certainly seems like something that needs full attention which I find hard to give on an e-reader which tempts me to skim rather than dwell on the page. Im getting more convinced by an argument used in a book called The Shallows: How the Internet is Changing the Way We Think, Read and Remember that we read in a vastly different way online than we do in print – we skim rather than read. I don’t think there’s any doubt about it. I find that eReaders work for some books and not for others. A picaresque novel can work, e.g. Rappaport, (which is only available as an eBook anyway) because it’s a book with a series of episodes, and it’s also a book you can dip in and out of without compromising it. But any book where something in the text prompts you to flick back over the pages to make a connection is no good. (By the time you’ve used the Kindle search function, you’ve forgotten where you were and why you were looking for it). I agree, BookerTalk, that it’s harder to give full attention to an e-reader. Even when I enjoy a book, I find later I’ve forgotten a great deal about it – somehow without the physical, tangible experience of holding the pages (and seeing the cover regularly), it doesn’t ‘stay’ with me as much. Lisa, sorry you’ve been unwell and your father too; wishing you both speedy recoveries. Thank you Anna, my father is very old, these things are bound to happen but he has had the very best of care at Monash. Not just world class medicine, but wonderful caring staff. We are so lucky here in Melbourne, we really are.